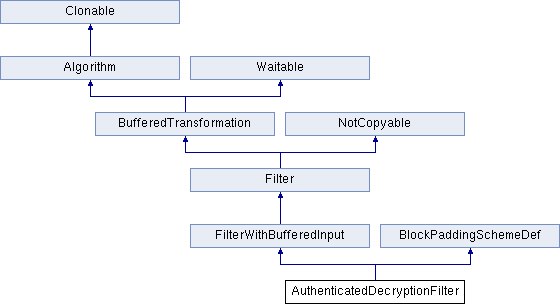 Filter wrapper for decrypting with AuthenticatedSymmetricCipher. AuthenticatedDecryptionFilter() is a wrapper for decrypting with AuthenticatedSymmetricCipher(), optionally handling padding/unpadding when needed. Definition at line 685 of file filters.h. The flags are a bitmask and can be OR'd together. Indicates the filter should throw a HashVerificationFailed if a failure is encountered. Definition at line 691 of file filters.h. Additional authenticated data should be given in channel "AAD". truncatedDigestSize = -1 indicates DigestSize should be used. Definition at line 991 of file filters.cpp. Definition at line 715 of file filters.h. Definition at line 1012 of file filters.cpp. Definition at line 1023 of file filters.cpp.